While folks overseas have watched Simpsons compilation DVDs for years, those of us in the States never encountered collections of that sort. Instead, Fox did the right thing and only released full season packages for the series. Granted, it’s taking them forever to do so, but at least the final product seems strong. Perhaps as a response to the excruciatingly slow release schedule, US viewers now will get some of these theme DVDs. 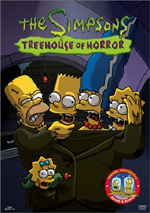 Logically released about two months prior to the big “trick or treat” day, Treehouse of Horror offers four of the series’ Halloween episodes. I’ll present story synopses straight from the show’s official website and also offer my own thoughts on each program. A trio of good stories, each one offers something special. “The Shinning” is a fun parody of the Kubrick flick. The cannibal segment gives us the most laugh out-loud moments of the three; it’s a little simplistic at times but remains darned funny. The time travel bit proves to be the show’s biggest winner. While not quite as humorous as the cannibal plot, it seems much more inventive and creative, and it’s very funny as well. “Attack of the 50-Ft. Eyesores” stands as the strongest of the three segments. It doesn’t blast off the screen but it seems imaginative and fun. The Nightmare on Elm Street parody has its moments and comes across as generally entertaining. However, it lacks the bite the best pieces offer. Unfortunately, “Homer3” gives us the weakest of the bunch. It tosses out a few funny bits, but it mostly feels like an excuse to feature some 3-D animation. Treehouse of Horror VII (air date October 27, 1996): “In this year's spooky series of Halloween stories, Bart discovers that he has a special new sibling, Lisa discovers that she is a God to a race of tiny people, and the American people discover that Bill Clinton and Bob Dole are actually aliens Kang and Kodos. In the first segment, Bart investigates noises from the attic and learns that his formerly conjoined twin, Hugo, is locked up there. Hugo is a wild, fish head-eating savage who was locked away because Dr. Hibbert determined that he was evil at birth. When Hugo captures Bart and tries to sew himself back together with his brother, it's up to the doctor to save the good twin. But can he tell for sure which is which? In the second tale, Lisa generates microscopic life inside a plastic tub that quickly evolves into a full-blown species of tiny humans. The tiny people consider Lisa their God. In the final story, Kang and Kodos beam Homer aboard the spacecraft and ask him who the President is. Homer thinks it might be Bill Clinton…or is it Bob Dole? Kang and Kodos beam Clinton and Dole aboard, assume the identities, and both run for President. Homer makes it his mission to expose the two false candidates." After a less than great episode last year, “VII” rebounds fairly well. Actually, only two-thirds of the program seems really good. The first two segments seem quite creative and amusing, but the presidential one largely falls flat. It tries a little too hard to make a point about the state of the political world and seems a bit lame. However, I really like the first two, as they present good stuff. Lisa’s society is particularly great and works terrifically well. Like many episodes from recent seasons, “XII” doesn’t present many significant flaws, but it also doesn’t ever really shine. Some good moments pop up here, mostly due to vocal performances. Brosnan offers a surprisingly nice turn, and Dan Castellaneta’s work as the leprechaun in the first segment is a hyperkinetic wonder. Nonetheless, the overall tone seems a bit lame, and the Harry Potter parody ends the show on a drab note. 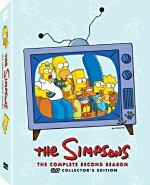 “XII” isn’t bad Simpsons, but it’s easily the weakest of this DVD’s four programs. 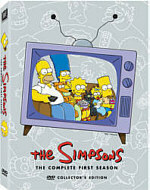 The Simpsons: Treehouse of Horror appears in an aspect ratio of 1.33:1 on this single-sided, single-layered DVD; due to those dimensions, the image has not been enhanced for 16X9 televisions. Although all of these shows were made more recently than any on the season sets, they seemed a bit uglier and clearly didn’t enjoy the care put into the bigger packages. Sharpness varied. Much of the time the shows were reasonably distinct and detailed, but more than a few soft spots occurred. The programs never became grossly undefined, but they often seemed somewhat bland in that department. Jagged edges and shimmering popped up sporadically but didn’t cause any real problems, and I also observed no issues connected to edge enhancement. Source flaws were a more significant concern. Actually, I thought those were the shows’ biggest problem. Quite a few examples of specks and marks showed up throughout the programs. “Treehouse XII” was made only two years ago, but it already demonstrated a few defects, though not as many as with the older shows. Admittedly, the flaws could have been much worse, but I still thought they were too prevalent for the series. Colors looked fairly drab. They lacked much vividness and sometimes came across as somewhat runny and messy. Much of the time the hues were acceptable, but they never betrayed much life. Oddly, skin tones looked greenish-yellow for much of “Treehouse VII”. Black levels were similarly flat and mediocre, while shadows seemed a bit too murky and opaque. I waffled between giving Treehouse a “C-“ or a “D+” for picture. I went with the former just because I thought the shows remained watchable enough to earn that mark, but I still thought they weren’t impressive visually. 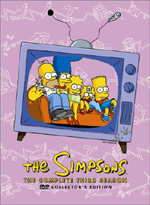 While the full-season sets of The Simpsons feature Dolby Digital 5.1 audio, the shows on Treehouse of Horror included only the original Dolby Surround 2.0 tracks. Since the 5.1 mixes haven’t exactly set the world afire, I thought the 2.0 audio seemed quite sufficient. The soundfields appeared more aggressive than what I heard during the three full season sets. Not that they went hog-wild, but they used the sides more often for movement and effects, and the surrounds kicked in more frequently as well. Elements might go from front to rear, and the back speakers contributed a better than expected sense of place. The whole package tied together well and seemed like a fairly vibrant expression of environment. Audio quality also was good, though speech seemed somewhat weaker than expected. Most of the dialogue remained nicely natural and distinct, but a surprising amount of edginess crept into the mix. Effects were clean and accurate, and they showed quite nice bass response. Music also sounded pretty well defined and detailed, and the score demonstrated good dynamics. Were it not for the edginess to some speech, the mix would have earned a slightly higher grade, but as it stood, Treehouse got a pretty solid “B”. The bargain-priced Treehouse includes only one supplement, and it’s a crummy one. We find a featurette that focuses on aliens Kang and Kodos. It lasts a mere 187 seconds, and it simply presents a montage of clips from some of their appearances. It’s a waste of time. The Simpsons: Treehouse of Horror definitely isn’t a waste of time, and it should interest fans who grow impatient to get these episodes via their respective full season DVD sets. Heck, it’s going to be a while before we get to any of those years, so at least we can enjoy them on DVD during the interim. Unfortunately, although the audio generally works well, picture quality seems a bit weak, and the set includes only one lame extra. For about $15 list, Treehouse of Horror is a decent collection of some good material, but the lackluster execution of the set means I can’t recommend it heartily.